Born April 12, 1947 in Indianapolis, Letterman’s first appearance on The Tonight Show Starring Johnny Carson was November 24, 1978. In total, Letterman had 22 guest appearances and also guest hosted The Tonight Show numerous times. NBC had hoped to keep Letterman on its roster, but with Johhny Carson vacating his Tonight Show seat, and Leno succeeding him, Letterman felt shafted, unwanted, and unappreciated. He felt he deserved the 11:30 pm spot — a spot he had waited 11-1/2 years to attain. CBS, having also struggled to find a show to begin its own late night franchise, saw a chance to steal away a talented and proven late night star. Sure enough, in 1993 Late Show with David Letterman premiered on CBS. That same year, it garnered 7 nominations (the highest nominations ever given to any late night program in its premiere year). 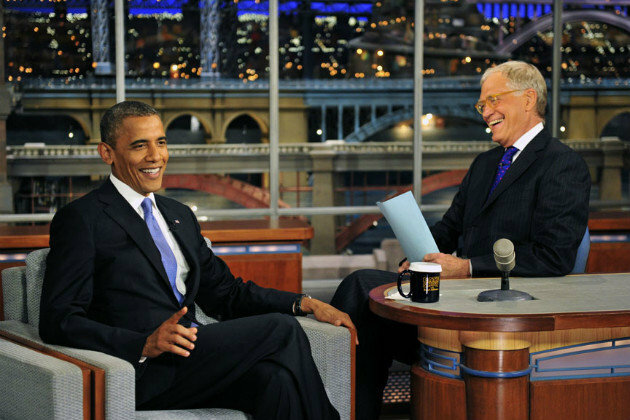 Today, Late Show with David Letterman trails against NBC’s Tonight Show Starring Jimmy Fallon.